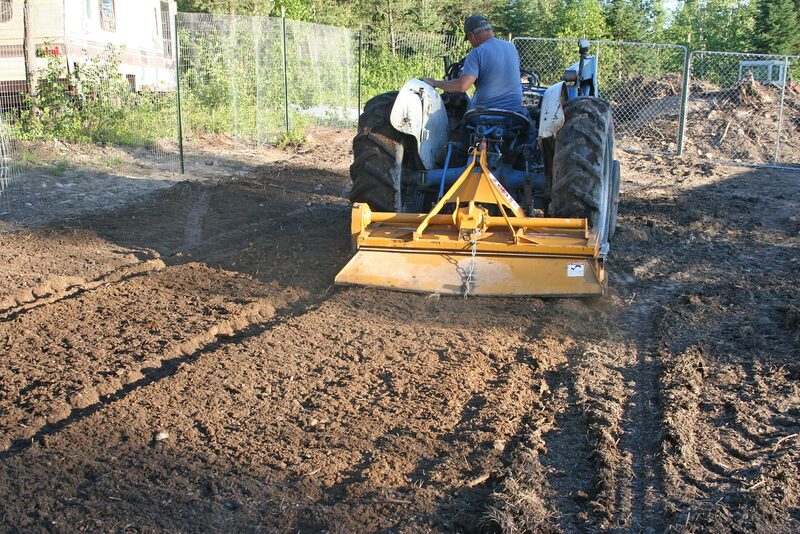 Will tilling the Sand Garden for the first time, working in the rotted manure he’d spread. On Tuesday Will took the Ford tractor out into our new sand garden (now the official name) and began to till. The very back and lower end were wet due to the inch of rain we got, but he wasn’t going to till those spots anyway because they were still full of rocks and we have to get things planted. Ashley, Alisha (our new apprentice), and I were out there waiting with our collective breath held. And TA DA! It tilled up just wonderfully. So we set about planting. The untilled section was planted with three species of pumpkins: Iran (a gorgeous orange and dark green blotched, smooth pumpkin we grew last year on trial), San Filipe (an orange, ribbed, old pumpkin we love) and Dishpan Cushaw (a gray, flatish, round pumpkin). 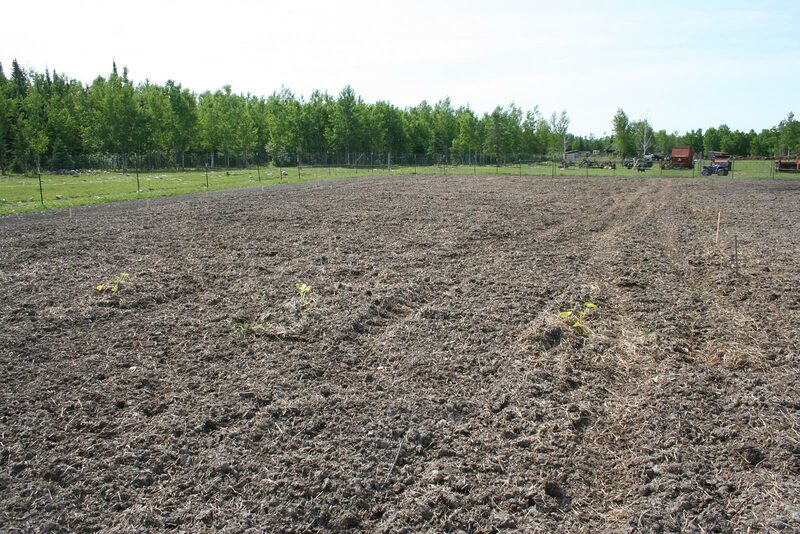 There is lots of manure on those spots so the pumpkins should do well and can climb over the sticks and rocks still in the area. 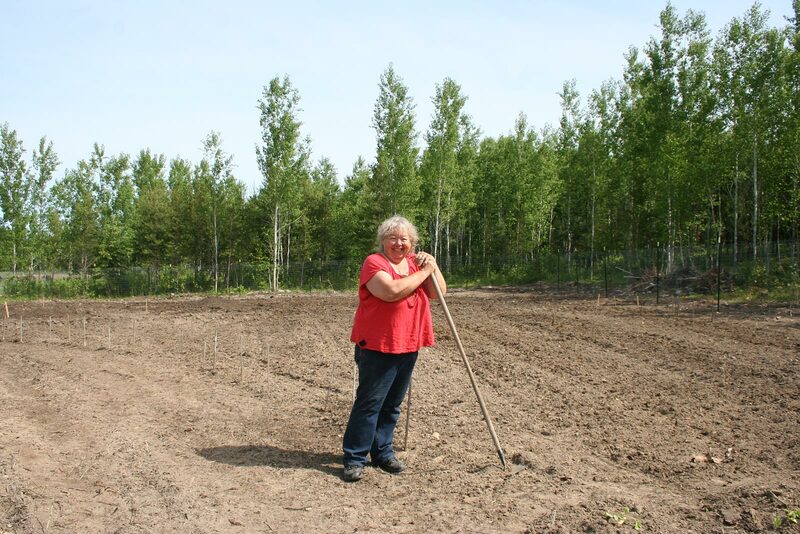 Then Alisha and I planted three LONG rows of potatoes (Dakota Pearl, our dependable old standby for home use, plus a few “fancy” potatoes, just for fun. They are purple and white with yellow meat (Masquerade) and white with blue eyes and white with red eyes (can’t remember the names, offhand). Our Bliss Triumph potatoes in the main garden are up and doing well. Alisha learned to plant potatoes, corn, beans, and melons today. After the potatoes, we planted Seneca Sunrise sweet corn, several melon varieties to try, pole and bush beans, a Cherokee Long Ear corn, which is quite late and Papa’s Red flour corn, which is very early. With varying pollination times, the corns will not cross so we can save seeds. I’m so happy to have Alisha helping us this year. She’s enthusiastic and a hard worker, plus has a great sense of humor. 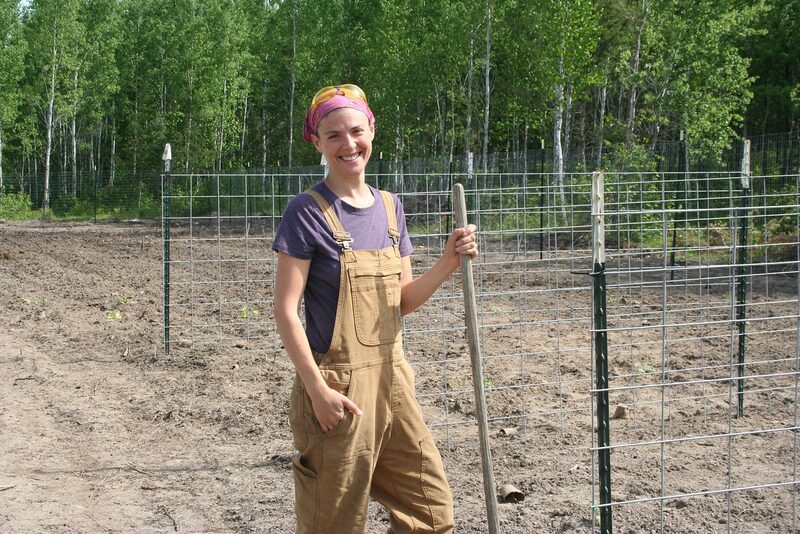 She’s learning a lot about homesteading, wild plants, and living off grid. So it’s a nice trade off. I get a rest while Alisha goes for more seeds. We did have a hold-your-breath night recently. The night temperature was supposed to be 40° F. Then on the 10 o’clock weather, they posted a frost advisory, but not for our area. We are pessimistic about such things and debated on what to do. We decided to get up in the middle of the night and check the temperature. At 4 o’clock it was 36 degrees. Oh oh… Then at 5:30 it was 34 degrees. Boy, I’ll tell you we were praying mightily! With nearly 200 tomatoes in and only 30 protected and no way to quickly protect the rest we were holding our breath. Just as the sun came up Will spotted a little frost on parts of our house roof, but it quickly melted with the sun. Was the garden frozen? We had beans, potatoes, and tomatoes up. I went out soon after and found we’d escaped with only a tiny bit of damage to the transplanted pumpkins and melons in the north garden where it’s lower. Thank you God! The North Garden is nearly all planted too! Nope, we are growing Irish potatoes, not sweet potatoes. I’ve tried them various ways with no success so we stick to squash as a substitute. Sorry to hear about your frost on the corn. Boo. That happens but we don’t have to like it! The unmanured parts of your sand garden sound like a good place to grow sweet potatoes. (Jackie knows but if you don’t sweet potatoes will produce lots of leaves (edible) in fertile ground but few or no sweet potatoes.) Sand Hill Preservation Center has a huge crop of sweet potato slips and they are half price now (except for postage charges). Yes sweet potatoes can be grown in short season cold climates and these are the folks who can tell you how and sell you the slips. A home grown sweet potato has a wonderful flavor. And if you don’t want to order slips, Glenn and Linda can certainly benefit from your prayers right now. Nope, Irish potatoes, not sweet potatoes. But if you heavily manure Irish potatoes, they often grow tons of plant but not so many potatoes. I’ve tried and tried with sweet potatoes, using plastic, greenhouses, and so forth; no luck. If you live in a slightly more hospitable climate, be sure to try some of Glenn and Linda’s sweet potatoes! They are very nice and there are tons of different ones to choose from. Looks like your ground worked up pretty good. You guys really have a lot of work cut out for you. Good thing there are four of you this year to do the work. I have had to cut back on how much I plant as my old back injury is bothering if I do too much bending and there is just one of me who can do the garden work this year. Still should have plenty for the family just not bushels to give away to neighbors. We have had enough clouds lately that 36 is the lowest we have seen in about ten days. It even hit 70 a couple days. Yea!!! 70 is so nice. I feel for you as I nurse along a back I broke when I was a teen, two compressed vertebrae from the fall off the barn roof and a couple of trashed knees. Today I can hardly move. But the gardens are planted and let the rain come!!! You get so much done in a day!! We just keep plugging away on stuff and in the evening are often amazed at what has been accomplished.